Okay, let me lay my cards on the table here: I only saw Jurassic Park for the first time a month ago. I don’t have childhood memories about seeing the movie. I don’t have that nostalgia attached to this movie. However, I know a good movie when I see one, and I absolutely loved Jurassic Park. But it’s been a long time since the general public has seen this franchise on the big screen, so it’s time to give it another go. Jurassic World brings us back to Isla Nublar where the concept of a dinosaur theme park for the family has finally succeeded and has spawned countless attractions. It’s soon revealed that at some point, the park overseers started screwing around with dinosaur DNA in an attempt to create the ultimate attraction: the Indominus Rex…which eventually escapes captivity and threatens the safety of everyone on the island. The big question everyone seems to be asking is, “Is it as good/better than the original?” To which I say, “Of course it isn’t! What did you expect?” While there is great fun to be had with this movie, Jurassic World feels more like a typical summer blockbuster than a true Jurassic Park follow-up. You can easily have a good time with this movie as long as you don’t compare it to the original, but let’s face it; everyone is going to do that anyway. Understandably, this movie is visually stunning. No, there are no practical effects to be seen anywhere, but it’s still impressive to see what the filmmakers have done with CG. Even if everything is new and updated, it all still looks like Jurassic Park. Strangely enough, I would also recommend going to see this movie in 3D, if you’re into that sort of thing. I know a lot of people think that 3D is the most disgusting thing to happen to modern-day movies, but this movie uses it surprisingly well. Going a little bit deeper than the look, I liked the premise that Jurassic World presents us. The Indominus Rex is created because attendance falls every few years. I know it’s crazy for us to think about people getting bored of dinosaurs, but in the context of the movie, I totally understood that mindset. I’m sure at one point, The Haunted Mansion ride in Disney World made it seem like the future of technology was upon us, but now it just looks a bit silly. That’s the kind of world this movie takes place in, and that is really interesting to think about. In addition to the premise, I liked all the little moments in Jurassic World where you felt like the park was a place that could exist. There are several scenes where the science of the park is being explained, including why some dinosaurs don’t look the way historians tell us they should, and that makes the story a bit more believable. Couple these scenes with the “wide shots of wonder” and John Williams’ historic theme music, and you’ve get some pretty great moments that feel straight out of the original film. Jurassic World also does action well. You don’t see many dinosaurs on film anymore, so seeing two of them fight to the death or hunt down their prey feels like something spectacular, even if we’ve seen it in movies before. On this note, I should probably mention that Jurassic World gets pretty violent. If you have small children who are easily frightened, then maybe you should screen this once before you bring them to see it. On the whole though, I’m glad they didn’t shy away from the violence. Jurassic Park was like an intimate survival horror movie, and since there’s no way to recreate that slightly scary tone with masses of people in the mix, I liked that Jurassic World at least tried to fill that scare-sized void in the narrative. Unfortunately, that was about the only void in the narrative they tried to fill. The rest of them were laid out plain as day in front of the audience. As I said before, Jurassic World feels less like the original film and more like the standard summer blockbuster. In this case, Godzilla is what comes to the forefront of my mind. Sure, the monster fight scenes are great, and seeing monsters threaten park-goers is a decent way to build tension, but everything else is either unintentionally laugh-inducing or boring. Yes, I said monsters. And yes, I meant monsters. Jurassic World is a monster movie, through and through. Like Godzilla, the movie tries to put a good amount of focus on its human characters. To Jurassic World’s credit, the original film did this as well, but it worked for them much better because their characters were actually interesting people. The characters in this movie are really just cardboard cutouts being moved around by stagehands we can’t see. The movie has great talent in Bryce Dallas Howard, Chris Pratt, and Vincent D’Onofrio, but even they felt like stereotypes. In addition to those performers, there are two kids that you follow around the entire movie, and honestly, I just could not bring myself to care for them at all. They weren’t very good actors, they didn’t have any secret sides, and they weren’t even great at acting scared. 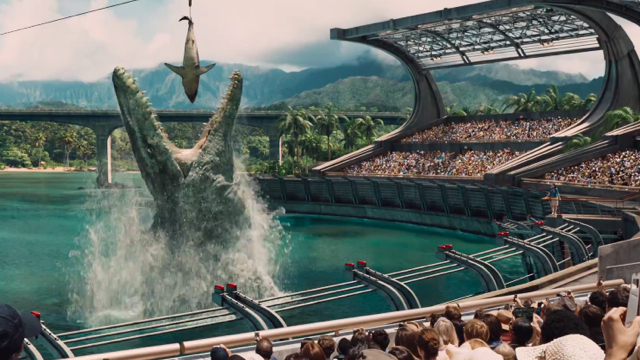 There’s nothing brand new about Jurassic World. There’s nothing fresh about it. It pales in comparison to the original film, but it’s still a good summer blockbuster and a great popcorn flick. If you’re okay with seeing a movie about dinosaurs that’s just fun to watch, then go see this movie, but don’t expect a new timeless classic. What did you think about Jurassic World?